Here's a quick and easy activity to keep kids busy at a restaurant. 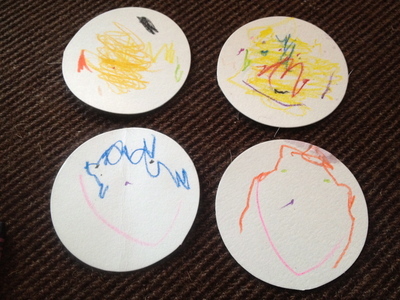 All you need is to find some cardboard coasters which have at least one side blank and some crayons. The idea is to draw a selection of meals on some coasters and people on other coasters and then match up the people to the meals they want. Imagine the coaster is a dinner plate. Draw a meal on each coaster plate. Imagine another coaster is a person's face. Draw the face onto the coaster. Match up the food with the people. Make up stories about the people. What are their names? Did they like their meal? What's their favourite food?